Turning Point Executive Director Paula Roller speaks to the crowd at the Party in the Barn campaign celebration Friday afternoon. Construction continues on the Delaware Turning Point facility. 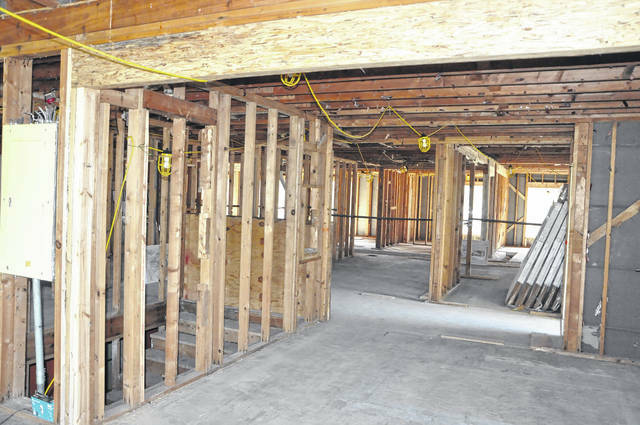 Turning Point officials said the entire interior had to be gutted and completely renovated. The facilty is scheduled to be completed by Spring 2018. Officials from Turning Point held an event Friday to raise awareness and funds for the upcoming Delaware domestic violence shelter. Staff and supporters celebrated being close to two-thirds of the way to their goal of $3.2 million. Plans for a Turning Point facility in Delaware were announced in September 2016 when Turning Point began accepting donations, hoping to reach $3.2 million in order to renovate a facility located at 500 North Liberty Street. When completed, the facility will be able to house 45 individuals and will have eight suites for families as well as transitional housing and a heated kennel for pets of clients. 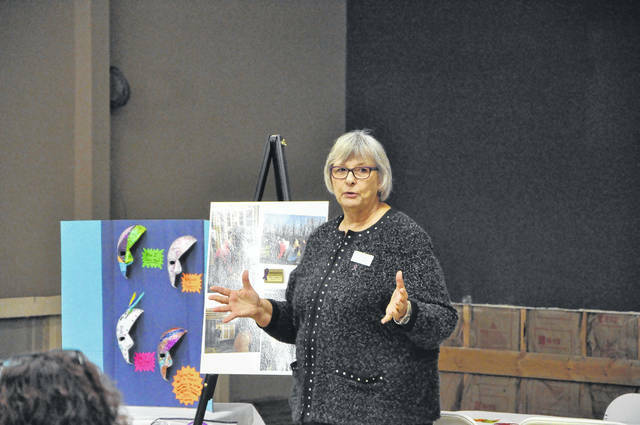 Executive Director Paula Roller said Friday that the agency has collected just over $2 million for the project and said she expects the facility to be completed in Spring 2018. Turning Point held a “Party in the Barn” event Friday to commemorate their progress so far and to recognize to Bill Cornely, a consultant who worked with the shelter to secure the location and get the Delaware project off the ground. Cornely passed away in June. Barb Lyon, the vice president of Delaware County’s United Way, said she worked closely with Cornely on the project and said he was “instrumental” in getting the campaign underway. “Bill sprinkled goodness and wonderfulness all throughout this project, and he gave so generously of his time and his treasure,” Lyon said tearfully. Lyon said Cornely’s family was offering a $50,000 match to inspire others to donate to the project. Attendees at the event were offered tours of the under-construction complex and were given information about how the facility will be laid out and function. Delaware County Sheriff Russell Martin also spoke at the event, praising the work of Turning Point and expressing his excitement that Delaware County will finally have a domestic violence shelter. Martin said domestic situations are the second most common call that law enforcement responds to on a daily basis in Delaware County. Donations to Turning Point can be made at http://turningpoint6.org/delaware-shelter.